Sweden announced its newly-formed government with the new Prime Minister and 22 ministers on Monday. 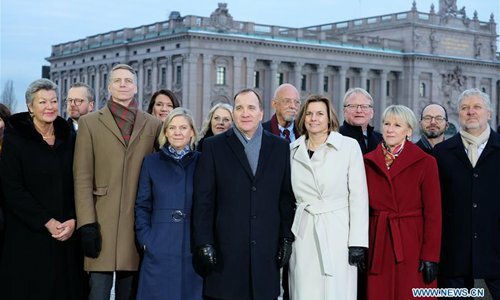 The newly-elected Swedish Prime Minister Stefan Lofven announced the ministers that make up the government and presented the Statement of Government Policy in the parliament on Monday. 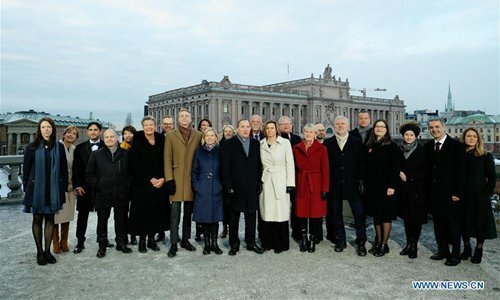 Sweden's new government is made up of the Social Democratic Party and the Green Party that will cooperate on the budget and the direction of policy in several areas with the Center Party and the Liberal Party, according to the government's statement. The new government consists of the Prime Minister and 22 ministers: Isabella Lovin as Minister for Environment and Climate, and Deputy Prime Minister, Margot Wallstrom as Minister for Foreign Affairs, Peter Hultqvist as Minister for Defense, Magdalena Andersson as Minister for Finance, Morgan Johansson as Minister for Justice and Migration, etc. "Now we can finally make a fresh start. The problems in society cannot wait... Sweden is in need of major reforms. We can now address these, together, across the old political blocs," Lofven said in the Statement of Government Policy on Monday. In terms of military alliance, Lofven emphasized that Sweden will not join the NATO in his term. "Our military non-alignment serves our country well. Sweden will not apply for membership of NATO," he said. Lofven also announced his country's staunch support to the EU membership, saying that "membership of the European Union is a foundation stone of Sweden's national, European and global action", and "will work for an effective EU." Sweden's general elections took place on Sept. 9, and Lofven was ousted on Sept. 25 in a mandatory no-confidence vote. After intensive cross-border negotiations, Lofven was voted back and got Parliament's approval as Prime Minister on Friday.